In 2010, we shared plenty of advice for local churches. But which was your favorite? We turned to a poll to find out the answer to that question. The biggest chunk of you liked our plea for accountability, authenticity and transparency. We shared this in light of the media accusing Ed Young of Fellowship Church of living a life of excess and luxury. Because if you’re not living a life of openness, you’re inviting skepticism and criticism into your ministry. Slightly fewer were most challenged by the call not just to preach, but to do. In one of your favorite posts of the year, Mark Horvath shared some insight and wisdom from his passion—homeless ministry. He challenged local churches to shift some of their focus from what they’re saying from the pulpit to what they’re doing in their community. Next up was a topic near and dear to all of our hearts: Christmas. Shawn Wood compelled churches not to put on a production spectacle they can’t match until next Christmas. You have to be true to who you are as a church, and even though it’s Christmas, give people what they’d normally get from your church. This way, when they show up again next Sunday, they won’t be confused and disappointed. As the phenomenon that was LOST ended this year, Sam DuRegger asked why the church isn’t getting the sort of cultural reaction that LOST did. His theory? Churches need to tell a better story. And lastly, just a slice of you were most excited that we advised you to tweet in church. Who knows if that’s because you really agreed with our position or your pastor is just so boring that you’re looking for anything to do during the sermon. This week, we’re moving into 2011 with a simple question for you, prompted by our interview with Tim Schraeder. 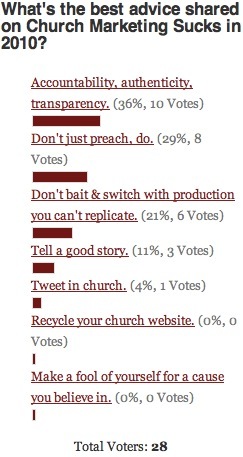 Head to the home page to vote: What’s helped you the most as a church communicator?